Call to schedule a “Spend-a-Day” with us and share in our joy! We’d love to add you to our Middle School Memories Album. The goal of our middle school is to reinforce responsible behavior and form independent learners who are leaders at the school. 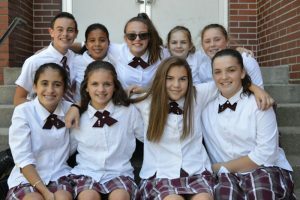 Beginning in grade 6, students have the ability to qualify for entry in the National Junior Honor Society, as well as take on leadership as a Student Ambassador, Tutor, or participate more actively in Campus Ministry. Grades 6-8 are departmentalized and so students change classrooms for the various academic disciplines. Latin is offered in grades 7 and 8, and Algebra 1 is offered for students in grade 8 who qualify. All students in grade 6-8 participate in both the Science and Engineering Fair as well as the History Fair. The school’s curriculum follows the standards from the Diocese of Fall River and aligns itself with the Common Core State Standards as is most appropriate. * The above classes are considered “academic subjects”: for the purpose of determining make up requirements and honors and awards. Students will receive academic letter grades, and /or number grades for each class. Effort and conduct grades are also included. It is the philosophy of our school and the Diocese of Fall River that children need to develop study skills as well as the discipline to make their learning experiences an integral part of their everyday life. It is also invaluable for students to continuously review mastered concepts and to apply them in varied ways. Technology is utilized both in classrooms and in the STEM/Computer Learning Lab to reinforce student learning. Teachers also communicate with parents through their classroom webpages to help open communication and build a bridge for student learning both in the classroom and through practice with parents at home. Click here to learn more about the technologies available at the school to support our middle school students.